While there's no one-size-fits-all dietary pattern to manage type 2 diabetes, children and teens, adults, and seniors have different nutrition needs and management goals. In general, there's no ideal distribution of calories from carbohydrates, fats, and proteins for people with diabetes, and therefore dietitians must individualize macronutrient distribution while keeping total calorie and metabolic goals in mind. 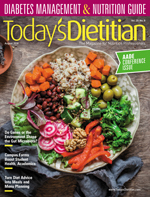 The good news is there's a wide variety of eating patterns that are acceptable for the management of type 2 diabetes.3,4 This article will discuss MNT throughout the lifecycle for type 2 diabetes to help dietitians better counsel clients of all ages. The medical community first began to officially identify children with type 2 diabetes about 20 years ago. Researchers involved in the SEARCH for Diabetes in Youth study released data collected from 2000 to 2012 that suggested there are 5,300 new cases of type 2 diabetes annually in US children aged 10 to 19. Cases of type 1 diabetes are more prevalent in children, but the incidence of type 2 has risen along with obesity rates. Because of the increase in obesity among youth, it can be challenging for clinicians to accurately diagnose type 1 vs type 2 diabetes.5 Stephen Ponder, MD, CDE, FAAP, a pediatric endocrinologist with the Baylor Medical System in Temple, Texas, and the 2018 AADE Educator of the Year, says he was practicing in south Texas when he first saw cases of type 2 diabetes in Hispanic youth. Type 2 diabetes disproportionately affects youth of ethnic/racial minorities from disadvantaged backgrounds. "Excess weight is the driving factor for type 2 diabetes," Ponder says. "We have learned that obesity is a family affair, and effective treatment plans must involve the entire family. Many at-risk families are living on the edge with limited time and food budgets so the challenge is to meet them where they are with our nutrition guidance." Ponder and his colleague Meaghan Anderson, MS, RD, LD, CDE, developed the acronym S.A.F.E. to describe basic changes families can make to decrease the risk of obesity and type 2 diabetes (see sidebar below). RDs can present these options and ask families to choose one or two of these interventions. "For example, a 16-year-old girl seen in our clinic lost 22 lbs in six months by substituting sugar-free beverages for sugary drinks," Ponder says. "Encouraging families to make small, simple changes that can easily be maintained is much more likely to impact long-term health than an impractical, complicated eating plan." Adolescents present a greater challenge because they can be particularly resistant to lifestyle modification interventions, Ponder adds, and "because they dislike being singled out or feeling they are different from their peers. Puberty also decreases insulin sensitivity. "2 When it comes to setting goals for weight loss, Ponder discourages giving specific numbers to families. Instead, he counsels parents of younger children that weight maintenance may be an appropriate goal if children are still growing. Older adolescents may become discouraged if health care providers set unrealistic goals of 100 lbs to reach "ideal" body weights. In general, a 7% to 10% weight loss should be the target.1 RDs should always praise positive behavior changes instead of focusing on medical outcomes. MNT for adults involves meal planning that takes carbohydrates, fats, and protein into consideration. Before recommending carb counting, dietitians should assess client interest and numeracy skills. Carb counting and use of insulin-to-carb ratios is beneficial for those on meal-time insulin or insulin pumps. Patients prescribed fixed insulin doses or secretagogues may find consistent carbohydrate intake is helpful for glycemic control and avoidance of hypoglycemia. The monitoring of carbohydrate intake generally is recommended for those on other medications or lifestyle therapy alone.10 RDs can encourage carbohydrate intake from vegetables, fruits, legumes, whole grains, and dairy products, with an emphasis on foods higher in fiber and lower in added sugars.1 Simplified meal plans (ie, plate method, portion control, food lists with carb choices) all can be effective.4,10 According to Janice MacLeod, MA, RDN, LDN, CDE, director of clinical innovation for WellDoc in Columbia, Maryland, and lead author of the Academy's nutrition practice guidelines, "A useful strategy is to encourage blood glucose monitoring before and after meals to determine how much carbohydrate an individual can tolerate without causing postprandial hyperglycemia. Blood glucose monitoring should be used strategically to help patients learn if the treatment plan components—including food, medication, and activity—are working in synergy." Using these data, RDs can help clients problem solve to improve postprandial glucose readings. One out of four older adults over age 65 has diabetes, and one-half of older adults has prediabetes. This population presents an interesting challenge due to its wide range of functional and cognitive abilities, economic resources, comorbidities, psychosocial issues, and living situations. You may see an 85-year-old who travels the world and a disabled, home-bound 65-year-old in the same day. Seniors may be living alone and receiving home-delivered meals or residing in assisted living or long term care facilities. Even though DSMES is a Medicare benefit, only 5% to 7% of those eligible take advantage of these services. — Kathy W. Warwick, RD, CDE, is a diabetes educator, freelance writer, speaker, expert witness, and consultant. Warwick currently serves as the print communications chair of the Diabetes Care and Education Practice Group of the Academy of Nutrition and Dietetics. She's the owner of Professional Nutrition Consultants, LLC, in Madison, Mississippi. 1. American Diabetes Association. Section 4. Lifestyle management: standards of medical care in diabetes — 2018. Diabetes Care. 2018;41(Suppl 1):S38-S50. 2. Nadeau KJ, Anderson BJ, Berg EG, et al. Youth-onset type 2 diabetes consensus report: current status, challenges, and priorities. Diabetes Care. 2016;39(9):1635-1642. 3. Evert AB, Boucher JL, Cypress M, et al. Nutrition therapy recommendations for the management of adults with diabetes. Diabetes Care. 2013;36(11):3821-3842. 4. Diabetes type 1 and 2. Academy of Nutrition and Dietetics Evidence Analysis Library website. www.andeal.org/topic.cfm?menu=5305. Published 2015. Accessed June 6, 2018. 5. Mayer-Davis EJ, Lawrence JM, Dabelea D, et al. Incidence trends of type 1 and type 2 diabetes among youths, 2002–2012. N Engl J Med. 2017;376(15):1419-1429. 6. US Department of Agriculture, US Department of Health and Human Services. Dietary Guidelines for Americans, 2015-2020. 8th ed. https://health.gov/dietaryguidelines/2015/resources/2015-2020_Dietary_Guidelines.pdf. Published December 2015. Accessed June 5, 2018. 7. American Diabetes Association. Section 12. Children and adolescents: standards of medical care in diabetes — 2018. Diabetes Care. 2018;41(Suppl 1):S126-S136. 8. National diabetes statistics report, 2017. Centers for Disease Control and Prevention website. https://www.cdc.gov/diabetes/data/statistics-report/index.html. Published 2017. Accessed June 2, 2018. 9. Schaffer R. Prevalence of comorbidities high in type 2 diabetes. Healio website. www.healio.com/endocrinology/diabetes/news/in-the-journals/%7Be8d2355d-0624-4b22-9870-5047a797b526%7D/prevalence-of-comorbidities-high-in-type-2-diabetes. Published April 25, 2016. Accessed June 2, 2018. 10. MacLeod J, Franz MJ, Handu D, et al. Academy of Nutrition and Dietetics nutrition practice guideline for type 1 and type 2 diabetes in adults: nutrition intervention evidence reviews and recommendations. J Acad Nutr Diet. 2017;117(10):1637-1658. 11. Estruch R, Ros E, Salas-Salvado J, et al. Primary prevention of cardiovascular disease with a Mediterranean diet supplemented with extra-virgin olive oil or nuts. N Engl J Med. 2018:378(25):e34. 12. American Geriatrics Society Expert Panel on Care of Older Adults with Diabetes Mellitus, Moreno G, Mangione CM, Kimbro L, Vaisberg E. Guidelines abstracted from the American Geriatrics Society guidelines for improving the care of older adults with diabetes mellitus: 2013 update. J Am Geriatr Soc. 2013;61(11):2020-2026. 13. American Diabetes Association. Section 11. Older adults: standards of medical care in diabetes — 2018. Diabetes Care. 2018;41(Suppl 1):S119-S125. 14. Kirkman MS, Briscoe VJ, Clark N, et al. Diabetes in older adults. Diabetes Care. 2012;35(12):2650-2664. 15. Gebel E. Diabetes distress. American Diabetes Association website. http://www.diabetes.org/living-with-diabetes/complications/mental-health/diabetes-distress.html. Updated July 29, 2014. Accessed June 8, 2018. 16. Powers MA, Bardsley J, Cypress M, et al. Diabetes self-management education and support in type 2 diabetes: a joint position statement of the American Diabetes Association, the American Association of Diabetes Educators, and the Academy of Nutrition and Dietetics. Diabetes Care. 2015;38(7):1372-1382. S: Sugar-sweetened beverages. Limit portions and/or substitute with calorie-free options. A: After-meal snacks. Encourage nutrient-rich, lower-calorie snack options. F: Fast food. Limit the number of visits per week, choose smaller portions, and limit convenience food items. E: Exercise. Limit screen time, decrease sedentary behavior, and encourage 60 minutes per day of activity for the whole family. — Source: Ponder SW, Anderson MA. Teaching families to keep their children S.A.F.E. from obesity. Diabetes Spectrum. 2008;21(1):50-53.